Special Offer - Call in for Special - Buy a set of Nitto Tires with a set of qualifying wheels, and get them mounted, balanced, and shipped for free! See More. 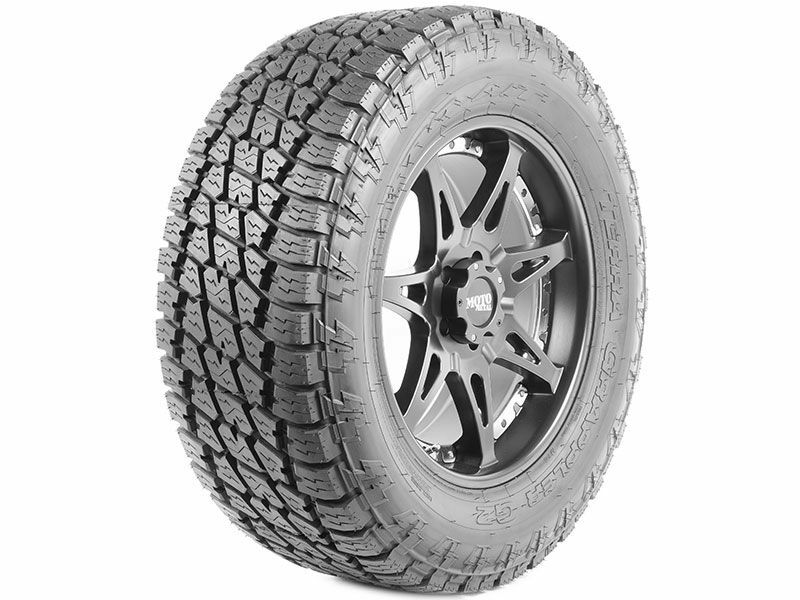 The Nitto Terra Grappler G2 is the next generation of all-terrain tires for your truck or SUV. Designed specifically for the demands of everyday on and off-road activities. Nitto wanted to make a tough tire that could get you through the rough trails while still being able to get you to work every day in comfort. The Terra Grappler G2 features a brand new rubber compound coupled with a re-design of the original Terra Grappler which makes a versatile all-terrain tire with an increased tread wear life. The new Terra Grappler G2 was such a successful design that Nitto backs it with up to a 65,000 mile tread life warranty, a first for Nitto all-terrain products. The Nitto Terra Grappler G2 has you covered going down your favorite mountain trail, hauling a load or just commuting to work. RealTruck will not accept returns for tires that have been mounted and balanced. If you are unsure of the correct tire configuration to purchase, please give us a call 1-888-257-3323. Nitto warrants all eligible tires against defects in workmanship and materials. Upon examination of an eligible tire, if Nitto determines that the tire(s) is not serviceable due to a condition covered by this Workmanship and Materials Limited Warranty, it will be replaced with a comparable new Nitto® brand tire. Please refer to the warranty and owners manual for what constitutes as an issue covered by the warranty. Wheel and tire packages that are "made to order" are non-returnable except in the case of warranty. If you have any questions and need help ordering, please call. We want to make sure your tires are ordered correctly to ensure you get the right tires for your vehicle. If you are changing your tire dimensions from stock you will want to have your speedometer & odometer recalibrated after installing your Nitto Terra Grappler G2 tires. Changing your wheel or tire size can affect the accuracy of your gauges as well as how your transmission shifts. To check out the tire recalibrators that we sell click here. If you have any questions or concerns please feel free to give us a call.